The ideal way for all skin types to remove dirt, makeup and impurities Foamacleanse effectively cleanses the skin without stripping the skin of its natural oils. Enriched with antioxidants to protect skin from the elements, it soothes and calms as it leaves skin feeling fresh and hydrated. Designed to gently remove impurities and target excess oil, Oilacleanse provides physical and chemical exfoliation thanks to microbeads and salicylic acid to keep pores clear. It also contains tea tree leaf oil for antioxidant and anti-inflammatory properties as it reduces acne-causing bacteria. A unique cleanser that effectively removes dirt and oil as it moisturizes, soothes and nourishes the skin, Normacleanse sets the stage for skincare products that follow. This formulation also contains peptides and other collagen-boosting ingredients to improve skin firmness and the appearance of fine lines and wrinkles. Exfoliation is essential for healthy, youthful skin. Offects Exfoliating Polish features ultra-fine magnesium crystals that effectively sweep away dead skin cells to reveal radiant, glowing skin. Fortified with antioxidant vitamins A, C, E and C-Esters, this twice-weekly treatment also improves circulation and skin texture while enhancing the absorption of skincare products that follow. 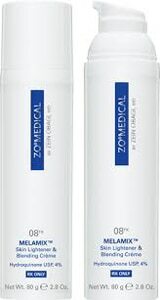 Combining the deep-cleansing benefits of a foaming cleanser plus physical and chemical exfoliation with microspheres, lactic acid and salicylic acid, this unique scrub sweeps away dull, dead cells to leave skin feeling smooth, refreshed and clean. Designed to optimize the skin’s pH, Balatone is formulated with a unique blend of ingredients that helps soothe the skin while providing a comforting, cooling sensation. In addition to removing any residue left behind after cleansing, it provides astringent and anti-inflammatory benefits while tightening pores. 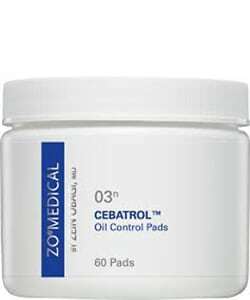 Offering a wide array of benefits for acne-prone skin, Cebatrol pads remove excess oil, minimize pore size and smooth the skin’s surface while reducing inflammation and irritation. These textured pads contain a blend of three exfoliating acids, soothing botanicals and non-comedogenic moisturizing ingredients. An effective alternative to prescription-based skin lighteners, Brightenex targets discoloration caused by sun damage, hormonal fluctuations and post-inflammatory hyperpigmentation (PIH). Designed to break up existing pigment and prevent new pigment from forming, this multi-action formulation features retinol, antioxidants and enzymes that rapidly brighten and even skin tone. 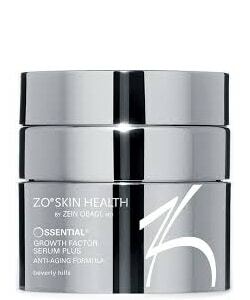 A cornerstone of the ZO Skin Health line, Ossential Daily Power Defense combines environmental protection, DNA repair, barrier repair and anti-aging benefits. Applied each morning, time-released retinol, antioxidants and enzymes to minimize free radical damage and uneven pigmentation while improving the skin’s function and elasticity. Developed for aging skin, this nightly serum boosts collagen and elastin production to improve fine lines, wrinkles and skin firmness. It also contains antioxidants to protect against free radical damage along with retinol to promote cell turnover and improve skin texture. 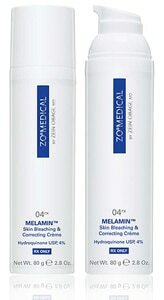 Available exclusively by prescription, Melamin Skin Bleaching & Correcting Crème contains 4% hydroquinone to fade the appearance of unwanted pigment. Added glycolic and ascorbic acids help minimize visible surface pigment as hydrating and anti-inflammatory ingredients keep skin calm and comfortable. Offering the skin-lightening benefits of 4% hydroquinone and the rejuvenating effects of tretinoin, this prescription-based treatment targets unwanted pigment as it hydrates, soothes inflammation and conditions the skin. Formulated with retinol, antioxidants and natural extracts that soothe irritation, this multitasking moisturizer calms, replenishes and rejuvenates the skin. 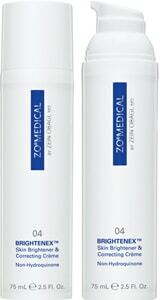 Designed for morning use, it helps prevent free radical damage and stimulates the skin’s natural repair process. Designed to calm inflammation and regenerate the skin while you sleep, this potent overnight treatment is ideal for severely dry and irritated skin. Its blend of ceramides, hydrating ingredients, natural extracts and retinol reinforce the skin’s barrier, support the skin’s natural repair process and promote collagen production for both healing and anti-aging benefits. Formulated to reduce redness, calm irritation and reinforce the skin’s barrier, Restoracalm provides rapid relief for sensitive or compromised skin. In addition to shielding the skin from UVA and UVB rays, this innovative sunscreen contains fractionated melanin to mitigate the damage caused by high-energy visible (HEV) light. Formulated with antioxidants, anti-inflammatory ingredients and barrier-supporting hydration, it’s ideal for all skin types as well as post-procedure skin. Formulated to prevent and repair visible signs of aging, Olluminate contains peptides and stabilized retinol to strengthen the skin and minimize fine lines and wrinkles. 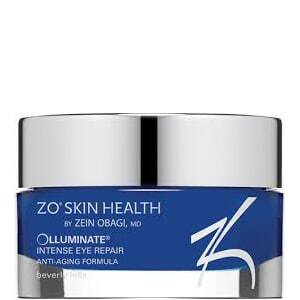 Its optical diffusers instantly reduce the appearance of dark circles as antioxidants and anti-inflammatory ingredients reduce puffiness and discoloration. Created especially for mature skin with multiple signs of aging around the eyes, Hydrafirm improves fines lines, wrinkles, dark circles and puffiness with a powerful blend of active vitamin A, plant stem cells, shea butter and more. Other benefits include restored elasticity, antioxidant protection and reduced inflammation.